One of my favorite things to both give and receive are subscription services. Whether it’s wine, food, beauty products or magazines, it’s so much fun to know the gift you’re giving will still be enjoyed long after the holidays are over. 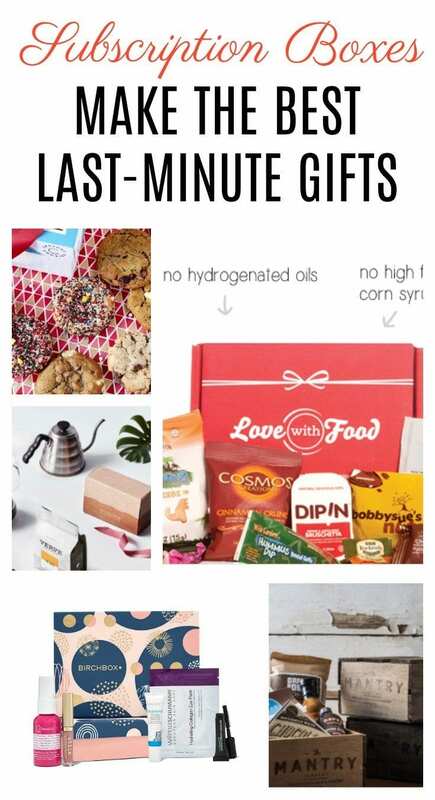 A subscription service is also the perfect last minute gift. Just print out the info about what they’re receiving and put it in a Holiday card. Voila! You’re done and they’re getting a gift they’ll love. I’ve rounded up some favorites below. What Is It: You receive new and popular snacks from around the world. You choose 5, 10 or 20 snacks per box and it’s very customizable. Give a one time gift, 3 months, 6 months, or 12 months. 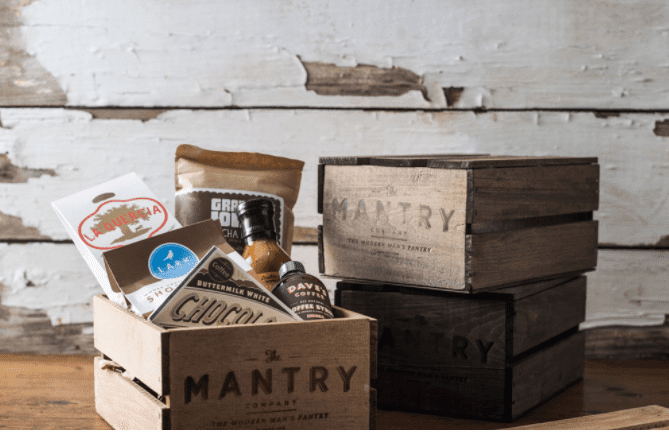 What Is It: Dude-friendly monthly themed snacks delivered to your door. 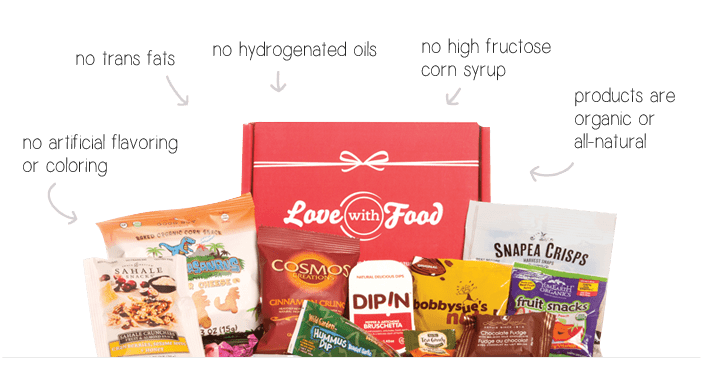 You receive six full-size snacks every month in a reusable wooden crate. 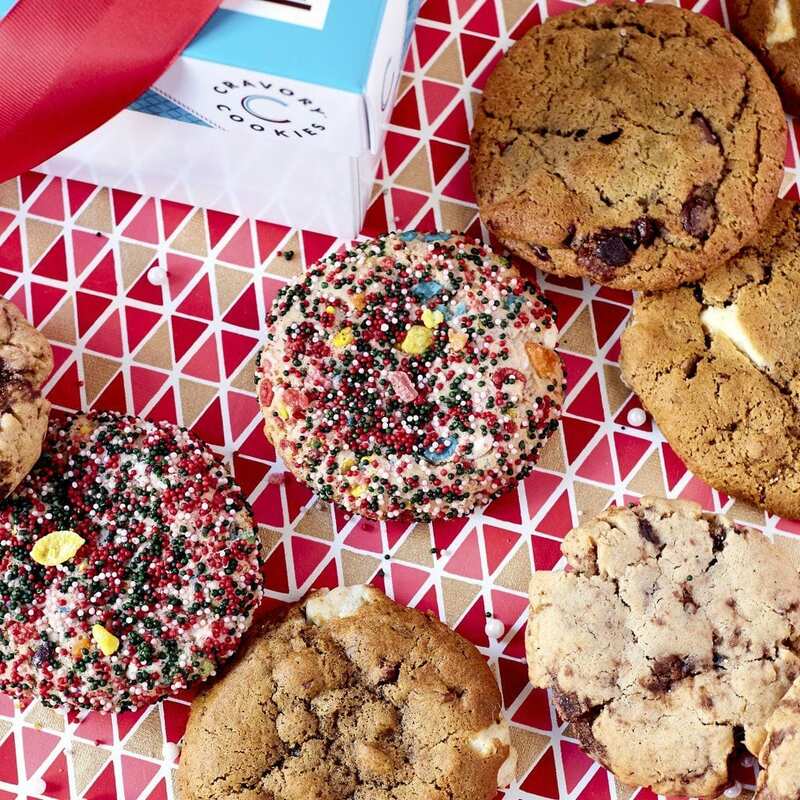 What Is It: Receive 6, 12 or 24 fresh baked, small batch cookies every month. The cookies are seasonal like pumpkin pie in October. Yum. What Does It Cost: Plans start at $9.95 + $5.95 for shipping. You can choose from pre-paid or ongoing plans. Choosing the prepaid plan will save you 25%. What It Is: It’s the best coffee you’ve ever made. 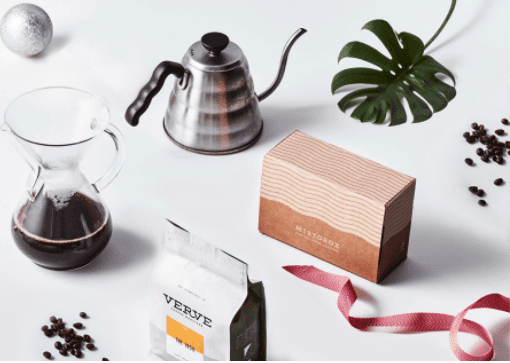 The box is personalized to your taste and their high-quality beans are roasted to order so you’ll always receive fresh coffee. Each box contains a 12 oz. bag of whole bean, fresh-roasted coffee, which brews about 30 cups of delicious coffee. What Does It Cost: Choose from 1, 3, 6 or 12-month subscriptions, which start at $20. What Is It: Every month you’ll receive 12 to 15 gluten-free and celiac-safe organic snacks. Also, for every box Love With Food sends out, two meals are donated to a food bank in America. What Is It: Receive all the ingredients you need to make delicious meals at home. Boxes come with farm-fresh produce, meat with no added hormones, sustainably-sourced seafood, recipe cards…basically everything you need to make incredible meals at home. What Does It Cost: Purchase a meal e-gift card starting at $60. What Is It: Get everything you need to make amazing meals—delivered in one perfectly customized box. Cook from a globally inspired, chef-designed menu with 20 recipes (plus dessert!) each week. What Does It Cost: Purchase Plated credit to give as a gift. Choose how many serving, how many meals and how many weeks. Prices start at $55.75. What Is It: This is your weeknight dinner solution. Receive high-quality ingredients sourced straight from the farm that come in convenient meal kits that fit perfectly in the fridge. There’s the classic plan, veggie plan and family plan. What Does It Cost: With a HelloFresh gift card, your friends will receive a single box of pre-measured ingredients and step-by-step recipes that’ll have them cooking up a storm in no time. No commitment necessary. Plans start at $59.94. 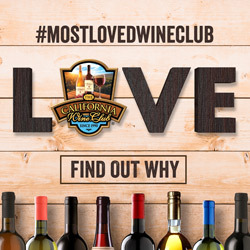 What Is It: Get exclusive access to delicious wines from renowned winemakers. Select the wines you love. Skip or cancel anytime. What Does It Cost: Purchase a wine e-gift card starting at $60. The Premiere Series starts at 2 bottles per month. 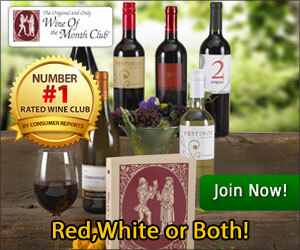 What Is It: Join the wine club! Choose from 11 different membership series such as the Classic Series, California Series, Rose Series and more. What Does It Cost: Series start as low as $39 a month. What Is It: From Rosé to Cabernet to Torrontés, they have over 100 styles of wine to discover. Ever try an orange wine? You receive 4 wines at a time – basically a party in a box. 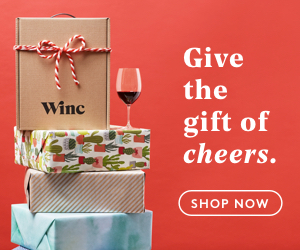 What Does It Cost: Give a Winc Gift Card starting at $60. What Is It: Tell them about your beauty preferences and they’ll use them to customize your box. Receive five monthly beauty treats. Purchase full-size versions of your fave samples (they ship free!). Get $1 back in Loyalty Points for every $10 you spend in their shop. What Is It: Customers fill out a style profile, which includes size and price preferences. Each month receive 5 pieces of clothing delivered to your door. Buy what you like and send back the rest. Shipping is free! What Does It Cost: Purchase a Stitch Fix Gift Card starting at $20. You can choose to print it, email it or mail it the old-fashioned way. Magazines: I did an entire post dedicated to the Texture app for magazines. A service I use and love oh so much. You can read all about it here.